Emotion, Mothers & Milk: What Emotion Research Tells Us About Conveying Facts To Worried Mums. Nothing resonates so emotionally with a mother as a threat to her baby. Food safety and quality concerns with infant foods have huge impact and, these days, any issue is quickly picked up and broadcast (often in simplified or exaggerated forms) over social media. Rumours spread and reputations sink. In 2008, a Melamine contamination of Sanlu brand baby formulas in China had a major impact on mothers’ perceptions of product quality especially for local brands. As I write, another infant milk contamination issue has hit Asia, this time traced to problems with powder produced by New Zealand dairy giant Fonterra. Coincidentally, AsiaEmotion has been evaluating emotional reaction to Growing-Up milk advertising in Asia, and the results have some clear lessons for those trying to rebuild confidence in the sector. 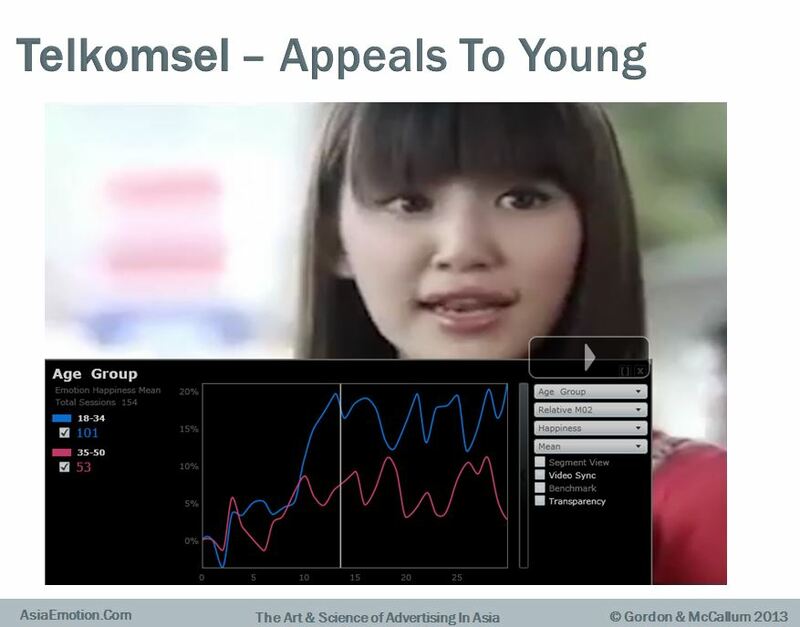 (AsiaEmotion is a large scale, Pan-Asian exploration of Asian consumers emotional response to advertising, carried out by Gordon & McCallum and Cimigo ulitlising nViso’s 3D Facial Imaging technology to directly measure emotions evoked. More details can be found in earlier articles on this site, or at www.asiaemotion.com). ………………. ……………………… …….. .. …….. ……………….. ……….. …….. …. … … ….. While the direct health consequences of the current problem seem to likely be limited, the fact that New Zealand has a “clean green” image in Asia and that it supplies milk powder both for its own brands and for other manufacturers means that the impact on reputation and trust may yet affect the whole category. What should a brand owner do under these circumstances? Clearly the first steps, learnt over many years and numerous PR disasters, are apology and transparency. Fonterra’s CEO is in China right now, doing just that. But as the public health problem fades, the issues for brands will become marketing ones: rebuilding trust and reinforcing or reigniting perceptions of quality. I’m going to focus on a couple of Growing-Up Milk ads from China.One is for a local brand Fei He, seemingly intended to prove it is substantive, concerned with quality, and essentially as good as “international brands” in all important respects. The other is for Dumex and is aimed at conveying its international status, reputation, and “gold standard” brand heritage. (To see the ads, and the emotive response to them, you can click on Feihe and Dumex Gold). These commercials can be seen as a response to the earlier Melamine scandal, in that the brand owners clearly see Chinese mothers as needing reassurance about quality and reputation. Both however, appear to have failed to engage consumers, particularly in the key message sequences. In the current context this matters – over coming months brands are going to have to convey some fairly clear messages about brand quality and reputation. So what lessons do these ads give us. Instant Noodles in India –Tug of War or Tugging Heartstrings? One of the fascinating things about using Facial Imaging when exposing competitive ads to the same respondents in a single category is that it provides unspoken clues about relative brand positioning issues (as FI does not rely on ‘rational’ recall or post-exposure rating). A brand with an inherently easy to understand positioning is more likely to get its message across clearly than a brand attempting to make consumers think about the product in a new light. Here, we see an example of an Instant Noodles brand, Horlick’s Foodles, taking on the task of provoking Indian mothers believe that instant noodles can actually be nutritious. It is done in a manner successfully demonstrated in previous posts (telling a story and building towards the main message), but the style of the execution is perhaps a little too dark. So it does not seem to reduce the high level of apprehension when the main ‘nutritious noodles’ idea is brought forward. Maggi, by contrast, takes an easily believable ‘life-saver’ message (that Maggi noodles are there and ready when you really need them) and pushes this in an engaging positive manner connected by a catchy jingle. Clever execution combines with a clear-cut positioning to evoke a strong response that builds positively. 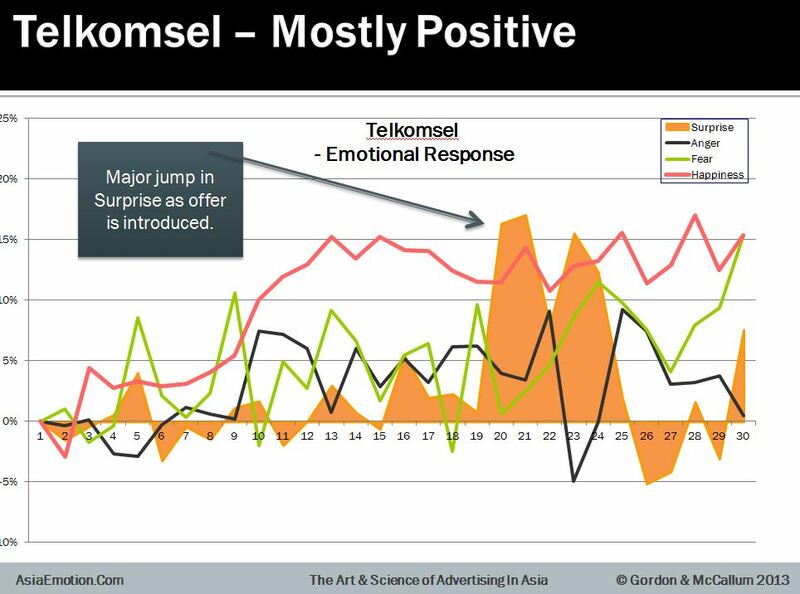 In the second of the AsiaEmotion series, we look at SE Asia’s largest market, Indonesia, and show why we think advertisers have a substantial Opportunity to Improve Emotional Punch. Using nViso’s breakthrough 3D Facial Imaging, AsiaEmotion recorded emotional response to ads directly technology and so is about how people actually felt as they watched, not what they said after. The study, completed earlier this year with leading Asian research agency Cimigo, covered 150 typical consumers in each of China, India, Vietnam, Hong Kong, & Indonesia across 75 recent and typical day-to-day commercials in high ad spend categories covering: Noodles, Shampoo, Telecom, Beer, CSD, Growing Up/Health Food Milks. The key regional takeouts can be found at 9 Essentials for Advertising in Asia on the AsiaEmotion website. 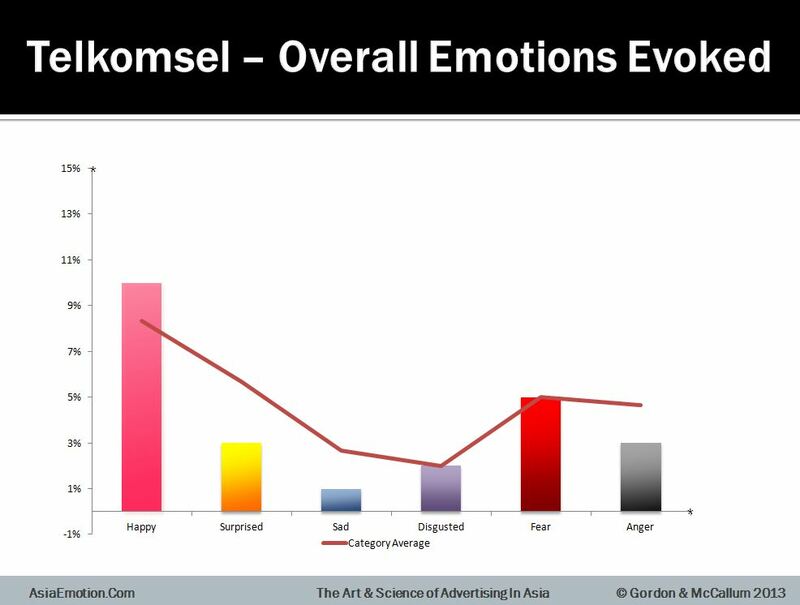 As a general observation based on the AsiaEmotion findings, Indonesian ads show lower emotional response than other large Asian markets. 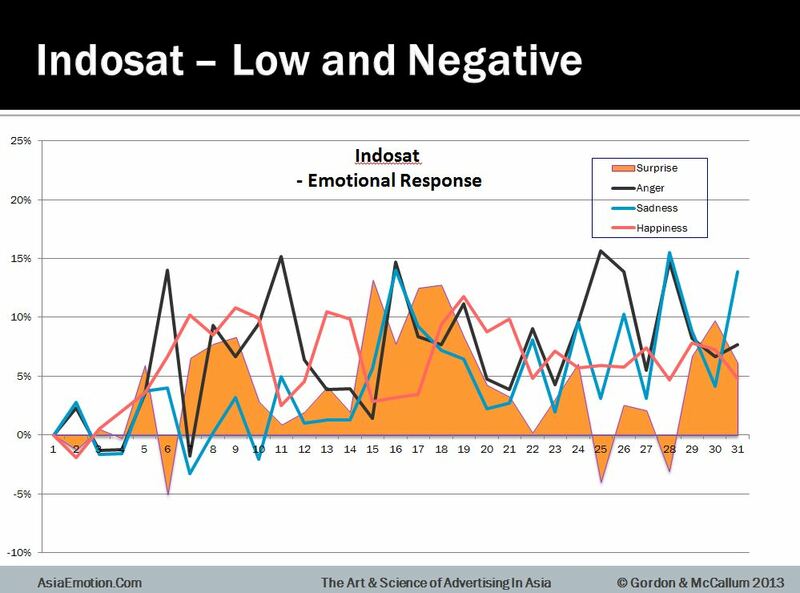 However, compared to Indonesian ads in other day-to-day categories, Telecom ads evoke about average levels of emotional response. 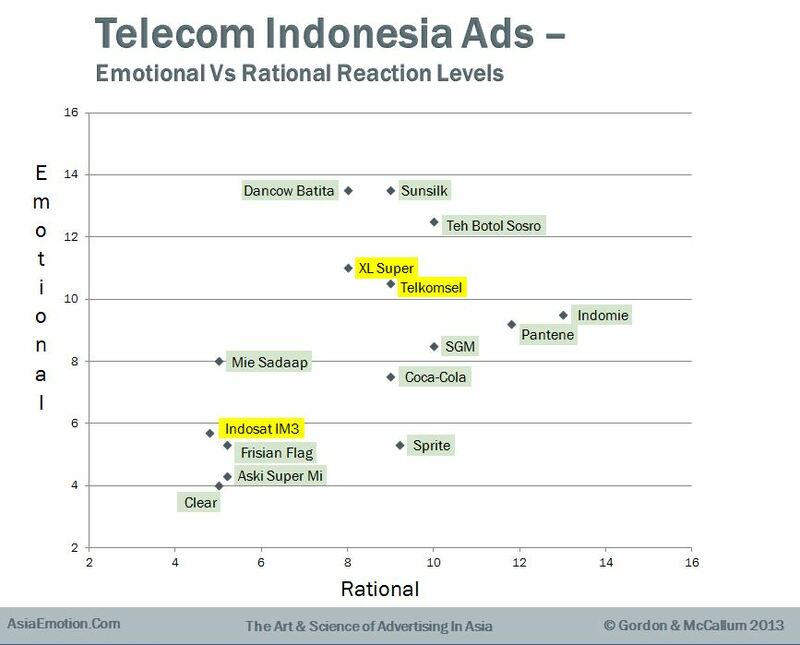 For Telkomsel in particular, the type, build, and shape of response were better than most Indonesian ads as whole. The lower “amount” of emotion may well be related to the high level of very direct product/deal promotion content in nearly all ads. Such scenes cause builds in response to plateau (Telkomsel) or drop off (especially for Indosat). The relatively low levels of emotion evoked represent an opportunity to increase cut-through and engagement. Telecom advertisers should consider separate distinctive strategies for brand building and product offering in order to generate more focussed executions. When reviewing the findings, Indirect Style Beats Direct Functional Approach. 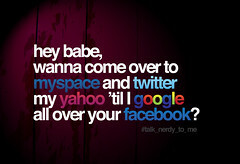 Telkomsel uses a dialogue between teenage girls to introduce their key message. The ‘teenage girl’ interaction (with a nice girl vs. nasty girl slant), realistic language, and mannerisms build interest among (presumed) key target groups. Indosat uses a Game show format to introduce its benefits. These are brought in early, very directly and literally “shouted” at the audience. The rapid change of scenes/visuals leads to low, negative emotive response with poor coherence. Again, Details Matter, the Telkomsel ad seems crafted to focus on specific target groups and their concerns and behaviours. This leads to more clarity in emotional terms. When and how the key service offer is introduced also appears to matter – overall we find it is better to bring such offers in parallel with the story or after emotion has built. This approach is taken by Telkomsel and looks to be more effective than in an immediate, direct recitation of the offer (as in the case of Indosat). Reactions to specific talent can distract or annoy. The MC, or his manner, in the Indosat ad seems to annoy women. AsiaEmotion results generally show that reactions to talent can vary markedly among sub-groups and celebrities should not be assumed as universal in their appeal. Furthermore, there is a peak in Apprehension/Fear during branding, which may show some nervousness about the brand itself, indicating a need for brand research to determine what is driving this. We see low levels of emotive response with no clear pattern and quite high negatives. (Rational responses to traditional MR questions on interest etc were also lower than others.) These erratic response patterns are associated with rapid change of scenes and messages. 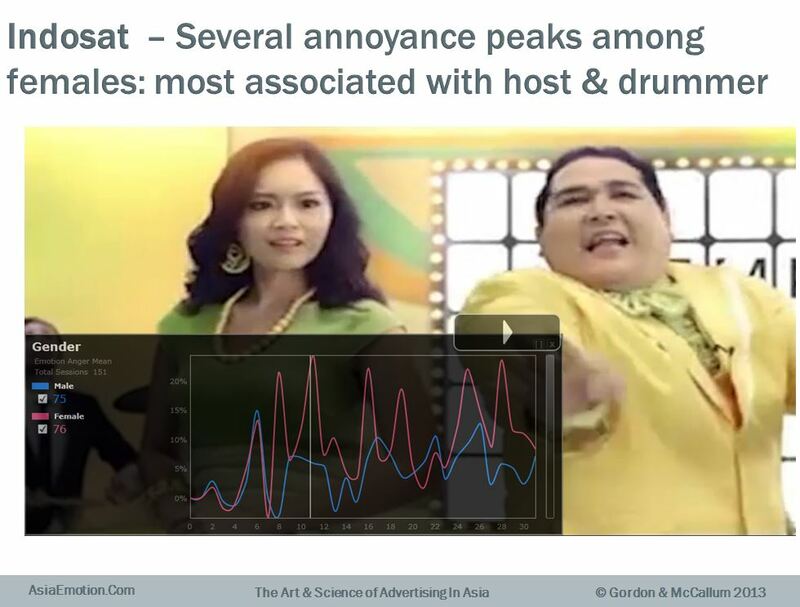 The male MC and the drummer seem to particularly annoy women and although Males and SES C show more positive response, it is still not high relative to other ads tested in the market. Low positive and high negative response during both branding and main message sequences, raise concerns that this ad could negatively impact brand equity. Overall then, ‘shouting out’ benefits, and getting them out up-front and early, while superficially useful tactics in the crowded media environment of Indonesian Television, may actually be counter-productive. Subtler approaches to emotional marketing may ultimately pay bigger dividends. Over the next few months we’ll be blogging a special series revealing the findings from AsiaEmotion, a pan-Asia study on everyday advertising in the region’s key markets. 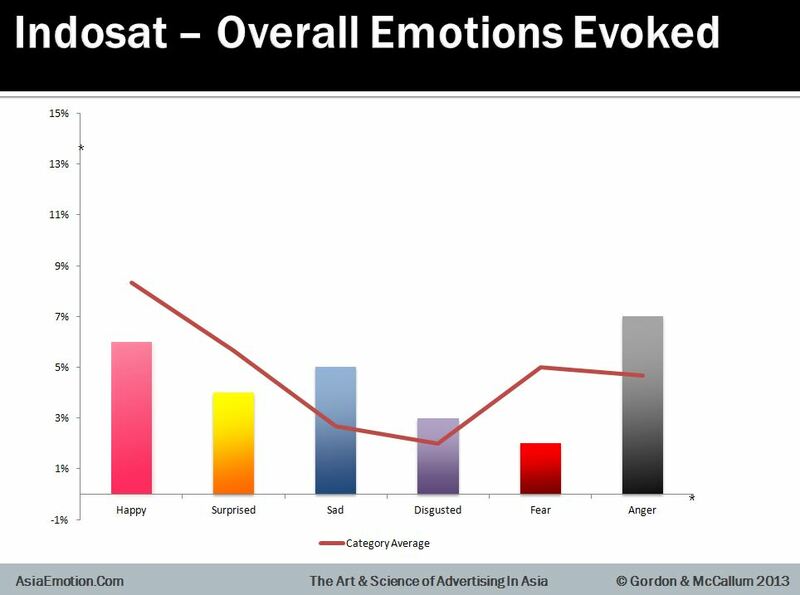 AsiaEmotion recorded emotional response to ads directly and scientifically using nViso’s breakthrough 3D Facial Imaging technology and so is about how people actually felt as they watched, not what they said they felt after the event. Men & Women Watching Ads – Different Markets or Different Species? The more I look at the patterns of response to advertising revealed by facial imaging the more I’m convinced that the old “Men are from Mars, Women from Venus” chestnut has validity. (Facial Imaging is the direct measurement of emotion via webcams – see www.nviso.ch if you want to know how it works). In essence major contrasts in reaction are the norm in the ads we’ve studied and this seems to hold across cultures and is not confined to the obvious categories like cars or alcohol. Yes, MR studies have often noted gender differences, but I’m not referring merely to broad reaction to the ad but the fact that the level, pattern and type of emotional reaction to specific elements of the commercial can differ wildly. Women (pink line) React To An Ad With Lots of Baby Shots. OK for a while, but get it wrong and you lose them. New Year, new start. As some of you who know us will realise, one of the reasons our blog postings have stuttered in recent months is that we’ve been far too emotional. Or at least far too involved in telling clients, MR and ad agencies about why emotional marketing matters, and why it’s not quite what they thought it was. Preaching To The Converted: More Useful Than You Think? We thought therefore, we’d start 2012 with a series of posts on what we think is the most important development in modern market research: our increasingly accurate ability to tap into consumer emotions. In particular, we want to do our bit to move discussion of emotion measurement from methods and applications towards the more important area of marketing implications. Why measuring emotion accurately really matters. Last year there seemed to be such a plethora of posts (including some of ours) about the top trends in the market research industry that we thought it was time for a break. But when Tom Anderson of Next Gen Market Research came up with the idea of a whole lot of NGMR bloggers simultaneously blogging on the top 10 issues the MR industry has to consider in coming years it seemed too much fun to miss. Here’s our views then — to be fair we’ve dropped out a few of the more totally obvious “top 10” and maybe elevated some we think are important but often overlooked — but we’ll be interested in hearing what you think (and do look up the others posts via Tom’s blog or on Twitter at hashtags: #NGMR #5Hot5Not). Let’s start with our 5 “Not Hot”. Reining in HR. After years of imposing restrictive salary structures and job description demarcations along with their depiction of creative staff as being ‘high maintenance’, senior management finally abandons the tedious tenants of HR orthodoxy and starts treating imaginative and innovative researchers in the same way the top advertising agencies treat their best art directors and copywriters. In some cases, they even get a place at the top table again!